639. arcishmAn – He Who has great luster. The word arcis refers to a ray of light. This is the basis for the interpretation of this nAma. He Who possesses arcis or great luster is arcishmAn. SrI rAdhAkRshNa SAstri explains that He reveals His luster or greatness to His devotee just at the level that the devotee can enjoy. He also gives the ability to His devotees such that they can experience His greatness. In truth, His Divine Luster is beyond nature, and so no one can ordinarily realize its depth and magnitude. b) SrI Samkara bhAshyam is that He is the principal Luminary by whose radiance the sun, the moon, and the others shine. Archishmanto tadIyena arcishA candra sUryAdayah, sa eva mukhyah archishmAn. SrI rAdhAkRshNa SAstri elaborates that just as a hot iron rod acquires redness like fire when it is associated with fire, so also the sun and the moon shine because they are associated with (have as their antaryAmi) bhagavAn. “There, neither the sun, nor the moon, nor the stars, nor the lightning has any effulgence; how then can this Fire-light illumine It? By Its Light alone, all else in the world illumined”. c) SrI baladeva vidyAbhUshaN, who is a follower of the gauDIya sampradAyam, gives the interpretation that bhagavAn is called archishmAn (jAjvalyamAnah) because He was shining with anger on hearing that kamsa had disgraced his father (ugrasena) by putting him in prison and dethroning him – kamsAt pitror-avaj~nayA jAjvalyamAnatvAt archishmAn. This is an example of how the different vyAkhyAna kartA-s have the anubhavam of the different bhagavan nAma-s to even better enjoy their own sampradAya-s.
640. arcitah – He Who is worshipped. a) SrI BhaTTar: All the guNa-s that have been described so far are consistent with Him being arcitah – To be worshipped. This nAma also refers to His incarnation in the arcA form. The other incarnations are limited to us by the time in which they took place (rAma, kRshNa, etc. 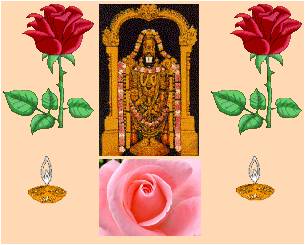 ), or the place where He is found in these incarnations (for example, the para rUpa in SrI vaikunTham). Unlike these, the arcA form is not at all limited in any way in Its accessibility to us, and is available to us in holy places, temples, and even houses at all times. The mysterious truth (guhyam) about the arcA form can be found in bhagavat SAstra (the pA’ncarAtra Agama), bodhAyana smRti, vaishNava purANa, and other scriptural texts. “After having shaped a beautiful image of vishNu with a lovely face and lovely eyes, out of gold, silver, and the like in a manner that would be pleasing, one should worship it, do sacrifice to it, and meditate on it. By doing so, one would enter into that form which is none other than Brahman itself, and will have all the sins dispelled”. SrI v.v. rAmAnujan gives reference to mudal tiruvantAdi 44 – “tamar ugandadu evv-uruvam avv-uruvam tAnE, tamar ugandadu ep-pEr, ap-pEr” – He assumes whatever shape His devotees want Him to assume, accepts whatever name they give Him, and becomes whatever form the devotees give Him when they meditate on Him. SrI rAmAnujan also refers us to gItA Slokam 4.11, which conveys the same thought. nammAzhvAr tells us the same truth in tiruvAimozhi 3.6.9 – ne’njinAl ninaippAn yavan avanAgum nIL-kaDal vaNNanE – We do not need to worry about our inability to access Him in His para rUpam in SrI vaikunTham; He will assume whatever form we give Him even in our thoughts. b) SrI Samkara’s interpretation is that the Lord is arcitah because He is worshipped and adored even by the likes of brahma. SrI rAdhAkRshNa SAstri comments that the likes of sUrya, candra, brahma etc. worship Him just so that they can have a fraction of His divya Sakti. SrI cinmayAnanda points out that the name “Worshipped” is given to Him because He is worshipped by Siva, brahma, etc. The dharma cakram writer points out that from this nAma, we can take the lesson that He can be worshipped in whatever form one chooses to worship Him, depending on one’s mental maturity in the path of sAdhanA. Note that the orientation of SrI BhaTTar’s interpretation is always in terms of bhagavAn always doing everything He does for the sake of His devotees, while SrI Samkara’s interpretation in invariably in terms of His parattvam. Almost without exception, this aspect is noticeable in every nAma, and the reader should keep this in mind in order to enjoy the different vyAkhyAna-s to the fullest extent. This point will not be repeated for every nAma, but seems to be true without exception for every nAma. a ) He Who is an object of desire. b) He Who shines in this world. c) He Who fills this world with His fame. d) He in Whom everything is contained. e) He Who envelops the earth. a) The first of these meanings – “He Who is desired”, is derived from the root kamu – kAntau, and the uNAdi sUtra kameh kum ca. (I could not find this specific sUtra in my copy of the siddhAnta kaumudi, but both SrI BhaTTar and SrI satyadevo vAsishTha have referred to this sUtra in explaining this nAma. An example of the application of this sUtra is in the formation of the word kumAra, which is also derived from the same root – kamu kAntau – to desire). Thus one interpretation for the nAma is He Who is desired – kAmyata iti kumbhah. He is desired by the devotees because He is the Ultimate in beauty, He is the One by reaching whom there is no more return to the ocean of samsAra, there is nothing more to desire after reaching Him, etc. SrI v.v. rAmAnujan gives reference to tirumozhi – accO oru azhagiyavA (9.2.1); to tiruppANAzhvAr – en amudinaik kaNDa kaNgaL maRRonRinaik kANAvE; and to tirumAlai – mAdaraAr kayarkaN ennum valaiyuL paTTu azhunduvEnaip pOdarE enRu Sollit tan pAl Adaram peruga vaitta azhagan ara’ngan, which all illustrate His being the Object of desire for His devotees. b) SrI BhaTTar gives the alternate interpretation based on the root bhA – to shine, in association with the word kum – this world. So He Who shines in this world is kumbhah – kau bhAti iti kumbhah. SrI BhaTTar attributes His shining in this world to His presence as the arcA mUrti in the shrines, and gives several quotes to support the sanctity of the areas around the sacred shrines, the power of the presence of His shrine in the temples etc. The reference to bhUmi here is thus to the divya deSam-s. Birth, living, or death in a divya deSam is the most purifying for any one. Yama and his servants won’t dare to approach one who dies close to a divya deSam. c) SrI kRshNa datta bhAradvAj gives the interpretation which is a variation of the above – kuh bhUmih prapa’nca pratIkah; umbhati pUrayati iti umbhah; koh prapa’ncasya umbhah – pUrakah sva-yaSasA iti kumbhah – BhagavAn fills this world with His fame and thus makes it complete, a fit place to live. d) SrI Samkara uses the meaning “container or pot” to the word “kumbhah”, and gives the interpretation that bhagavAn has this nAma because everything in this Universe is contained in Him like in a pot. SrI rAdhAkRshNa SAstri elaborates on this – BhagavAn protects everyone in this Universe like a vessel that protects the water contained inside it. He gives the following supports from the Sruti-s: ubhe asmin dyAvA pRthivI antareva samAhite (chAndogya. 8.1.3), and tasmin sarvam pratishThitam (bRhadA. 1.5.1). SrI cinmayAnanda gives yet another variation of the interpretation – He is called “The Container”, because everything that happens only takes place within Him. The dharma cakram writer explains that what is meant here is the He is the support for everything. All our friends and relatives can at best be supports for us only as long as we live; after that they can’t support us. He is the One who supports the jIva all the way until it attains mukti. But the jIva-s who are steeped in aj~nAna only think of the support from their friends and relatives, and do not realize that the real support comes from Him. We find many means to keep our eyes and ears in good shape, but we don’t spend the time to keep our minds in shape. This nAma tells us that He is the Only One who can support us in achieving this. e) SrI satyadevo vAsishTha derives the meaning from the root kubhi AcchAdane – to envelop, to cover, and explains that bhagavAn envelops the earth in the form of the sun etc., and so He is called kumbhah. 642. viSuddhAtmA – He of a pure nature. SrI BhaTTar’s anubhavam is that because bhagavAn sacrifices all that He has on His devotees, He is One of pure nature. AzhvAr’s equivalent nAma is amalan Adi pirAn, vimalan, etc. SrI Samkara gives the interpretation – viSuddha AtmA – The pure Atman – He who is beyond the influence of the three guNa-s – sattva, rajas and tamas, which keep influencing our actions and thoughts, and thus keep us attached to this body and ultimately bind us in samsAra. Since He is beyond the influence of prakRti whose attributes are these three guNa-s, He is not influenced by these, and thus He is pure. He is beyond all passions and desire, and all disturbances arising from these – triguNAtItah (SrI cinmayAnanda). SrI kRshNa datta bharadvAj gives the interpretation – viSesheNa Suddhah AtmA svarUpam yasya iti viSuddhAtmA. 643. viSodhanah – The Purifier. a) SrI BhaTTar: viSodhayati iti viSodhanah. bhagavAn has the nAma “Purifier” since He purifies those who give up their body in a holy shrine, by making them fit to attain Him. This is reflected in nammAzhvAr’s tiruvAimoshi 2.7.4 – ennaik koNDu en pAvam tannaiyum pARak kaiitu (tanna0) mevum tan mayam AkkinAn em pirAn vittu. viSesheNa Sodhayati vimalI karoti samArAdhana niratAn iti viSodhanah (SrI kRshNa datta bhAradvaAj). b) SrI Samkara gives the interpretation that He is the Purifier because the very remembrance of Him purifies us by destroying our sins – smRrti mAtreNa pApAnAm kshapaNAt viSodhanah. This purification happens because remembrance of Him keeps our mind from being influenced by the three guNa-s (sattva, rajas and tamas), and thus it enables us to realize Him (SrI rAdhAkRshNa Sastri). By remembering Him, the human heart becomes cleansed of its sins, immaculately swept of all consequent feelings of restlessness (SrI cinmayAnanda). SrI BhaTTar interprets the next few nAma-s as describing the vyUha (Emanations) and vibhava (Incarnations) of bhagavAn in the holy shrines. SrI v.v. rAmAnujan adds that the forms described are His representations in the para, vyUha, and vibhava forms in different kshetra-s. Note that the vyUha forms are the ones which are the precursors to the vibhava forms in the viSAkha yUpa tree, and are the forms which He assumes in the process of creating and maintaining the various beings in the Universe. 644. aniruddhah – a) He Who is in the form of aniruddhah. b) He Who is unobstructed. This nAma occurred earlier as nAma 187. The root from which the word is derived is rudhir – AvaraNe to oppose, to besiege. niruddha means obstructed, hindered, restrained, etc. a-niruddha is one who is unrestrained or unrestrainable. The nAma literally means “One who cannot be obstructed in any way” – na asti nirodho yasya sa aniruddhah (SrI satyadevo vAsishTha). SrI BhaTTar has explained nAma 187 by pointing that this Unobstructed Power is used by Him to protect all beings and to repel all opposition in this act of His. (Note that always bhagavAn’s acts are for the good of His creation, His devotees, His Sesha-s, and never for His pleasure or benefit! This is also seen in all His incarnations, such as the rAma and kRshNa incarnations, where none could stop Him from fulfilling the purpose of His incarnation). The aniruddha form is considered one of the vyUha forms. His main function in this form is protection of the beings (SrI rAdhAkRshNa SAstri terms this form as “kAppuk kaDavuL”). The dharma cakram writer observes that this form of bhagavAn also illustrates that He has the unobstructed Power to help His devotees who want to overcome the influence of the indriya-s.
SrI cinmayAnanda refers to the law of Truth and dharma being irresistible, as a demonstration of His irresistible power. SrI satyadevo vAsishTha gives the example of the inability of anyone or any way to prevent the jIva from leaving the body when the time comes for this to happen. For the current occurrence of the nAma aniruddhah, SrI BhaTTar gives the interpretation as referring to bhagavAn’s nitya vAsam as janArdana in the part of this earth called vasubhANDa. Some translators of SrI BahTTar’s bhAshyam refer to vasubhANDa as a kshetram. 645. a-prati-rathah – The Matchless. prati-rathan is one who can oppose another in a fight mounted in a chariot. a-prati-rathan is One who has no such person who can confront Him thus. bhagavan is matchless in the sense that no one can stand directly in front of His chariot and engage successfully in a war with him. na prati-rathah samAna SaktimAn ko’pi yasya iti a-prati-rathah (SrI kRshNa datta bhAradvAj). SrI v.v. rAmAnujan gives the reference to tiruvAimozhi 2.3.2 – “ottAr mikkArai ilaiyAya mAyan”. SrI BhaTTar gives the interpretation that as janArdana (The Tormentor of people who are wicked by nature), He is matchless in this task, and there is no one who can stop Him. SrI Samkara bhAshyam is – prati-rathah pratipakshah asya na vidyata iti a-prati-rathah. SrI kRshNa datta bhAradvAj gives reference to the gItA – na tvat samo’styabhyadhikah kuto’nya… (11.43) – “There is no one equal to You. How then could there be another greater than You in the three worlds?”. SrI cinmayAnanda’s anubhavam is that in the loving Presence of vishNu, everyone is vanquished, and there is no one even to threaten Him. a) He Who illumines the jIva-s.
b) He Whose wealth is of a superior order. c) The Bestower of all desires. d) He Who is endowed with great strength. The word dyumnam means wealth as well as luster. SrI Samkara uses the former meaning and SrI BhaTTar uses the latter. Other interpretations are based on the meaning “desire”, “strength”, etc. for the word “dyumnam”. SrI BhaTTar’s explanation is “Atma pradyotavAn pradyumnah” – He who makes the individual souls effulgent. Per information in SrI v.v. rAmAnujan’s book, we can worship pradyumna in tiru-allik-kENi. I believe tirunaRaiyUr or nAcciyAr koil is another kshetram where bhagavAn is present in the four vyUha forms. SrI satyadevo vAsishTha, who analyzes the meaning of each nAma by looking at the word syllable by syllable, derives the meaning from pra + dyu + mna (pra - prakRshTa, utkRshTa – Superior; dyu – luster; mnA – abhyAse - repeatedly. Thus, he gives the interpretation that bhagavAn displays His special luster again and again in the form of the sun, and so He is called pradyumna; or because He gives luster to the jIva-s repeatedly birth after birth. We can also extrapolate and have the anubhavam that because He takes several incarnations and keeps displaying His superior luster repeatedly, He is also called pradyumna. Thus, SrI satyadevo vAsishTha’s interpretation draws heavily on “mnA – abhyAse – repeatedly, again and again. SrI Samkara gives the interpretation “prakRshTam dyumnam draviNam asya iti pradyumnah” – One who has wealth of a superior order, or One who has enormous wealth. SrI cinmayAnanda adds that as lakshmI-pati, He is endowed with all the riches, and in His benevolence, He gives riches and mighty glory to all His devotees. Again, we note the difference in the approach of the vyAkhyAna-s of SrI Samkara and SrI BhaTTar – SrI BhaTTar emphasizes bhagavAn’s qualities in terms of helping the jIva-s, and SrI Samkara emphasizes His parattva. SrI rAdhAkRshNa SAstri gives the additional meaning “desire” to the word dyumnam. pradyumna is the Deity for manas, and in this role He creates the desires in us that contribute to the sustenance of creation. The dharma cakram writer gives the interpretation that the desires being fulfilled are those of the devotees to realize the Self. The best of desires that for Self-realization and for performing eternal service to Him. He is the Only One who can fulfill this, and so He is called pradyumna – The Bestower of all desires. SrI kRshNa datta bhAradvAj uses the meaning “balam” or strength for the word dyumnam, and gives the meaning “He who has distinguished strength” - prakRshTam dyumnam balam yasya iti pradyumnah. He quotes the support from medinI kOSam 1.20.11 – dyumnam vittam bale’pi ca. SrI baladeva vidyAbhUshaN also gives the same interpretation – prakRshTam anantam balam asya iti pradyumnah. 647. amita-vikramah – He of immeasurable steps. This nAma occurred earlier as nAma 519. See the write-up under Slokam 55.
vikrama means stride. SrI BhaTTar interprets the nAma as a reference to His tri-vikrama incarnation – trilokye’pi aparya vasita vikramatvAt trivikramah amita-vikramah – “In His incarnation as trivikrama, all the three worlds were no match for His three steps. So He is tri-vikrama”. SrI v.v. rAmAnujan takes amita as a reference to “innumerable”, and gives the interpretation that He has innumerable feet – tALgaL AyirattAi pErgaL AyirattAi tamiyanEn periya appanE (tiruvAi. 8.1.10). Note the declaration in purusha sUktam – sahasra SirshA purushah; sahasrAkshah sahasra pAt. SrI Samkara has given this as the first of his two interpretations fpr the earlier occurrence of this nAma (Slokam 55). Vikrama also means prowess, heroic valor. For the current occurrence of the nAma, SrI Samkara uses this meaning and gives the interpretation that He is amita-vikramah because of His unequaled prowess which cannot be injured by any one – amitah atulitah vikramah asya iti amita vikramah; a-himsita vikramo vA. This interpretation in terms of His boundless valor was given by SrI BhaTTar for the earlier occurrence of this nAma (519). SrI rAdhAkRshNa SAstri makes a connection to the previous nAma by observing that since pradyumna is the Lord of manas, He acts with unlimited speed of mind (power of mind) in His role as pradyumna, and so He is also called amita-vkramah. SrI cinmayAnanda remarks that as SrIman nArAyaNa, He is Omnipotent, and none can stand against Him. SrI baladeva vidyAbhUshaN, a follower of the gauDiya vaishNava sampradAyam, interprets the nAma in terms of the Prowess displayed by child kRshNa – ati-vikramiNAmapi cANUrAdInAm helaiva vinASanAt amita-vikramah – He is called amita-vikrama because He destroyed the likes of the mighty cANUra as if in a sport. Thus we see that the different interpreters interpret the nAma-s in terms of their sampradaAya-s, all of which are equally valid except when it comes to deep philosophical differences. Thus, in most instances, we benefit by getting exposed to multiple, equally enjoyable, anubhavam-s of His kalyAna guNa-s.